To start with i think you need to do for dry skin is. Moisturise with the thickest moisturiser you can find!! Your skin needs the hydration and finding a moisturiser that’s thick will do the job! 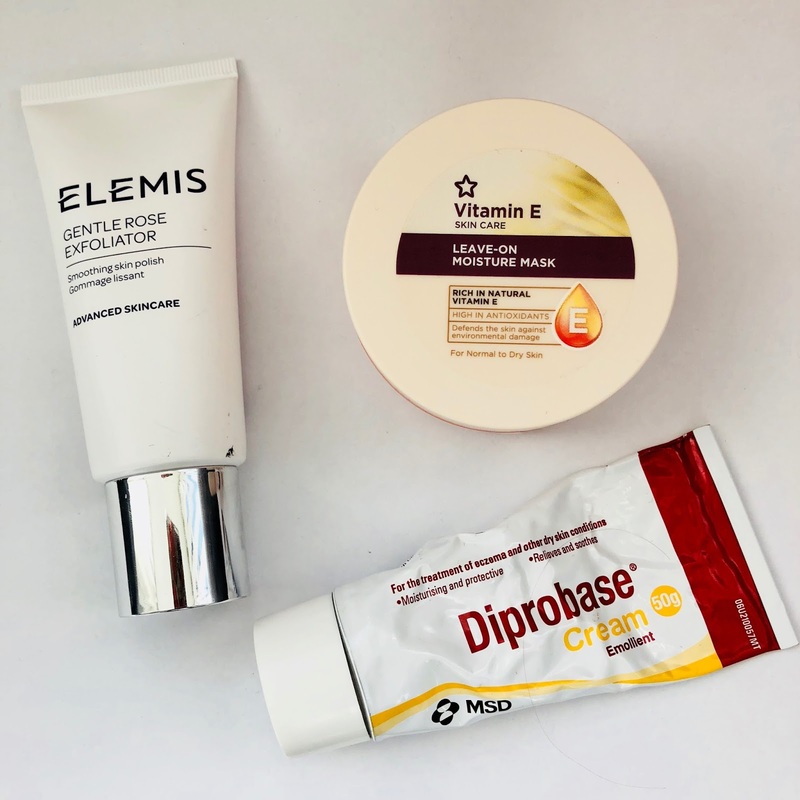 Personally I use diprobase as this has completely cleared my dry skin and was recommended from my doctor so it is safe to use on my face, as it’s usually for eczema or dry skin conditions. Next thing I’ve found is get a gentle exfoliate for your skin because it still feeds the dead skin cells to be removed but not harshly so your skin gets striped. Personally I use the Elemis gentle rose exfoliator as it not only does it help hydrate your skin but makes it feel super soft as it is gentle on the skin but being £30 it’s quite an investment but I bet the drugstore will do a cheaper alternative I just don’t have one. Onto more skincare advice, I’d recommend using a hydrating face mask! I’ve tried afew different masks and some haven’t worked so it’s really a trial and error process but the best one I’ve found is the Superdrug vitamin E leave on moisture mask and this is a godsend. With the serum like texture it hydrates my skin for 2-3 days which is amazing in just dealing with how dry it is. The most generic thing you’ll ever get told but I really stand by it. You need water like straight off. Your body needs to be hydrated to help put moisture into your skin because you have so much water in your body you need to help put back to it. Drinking water has many benefits for your skin and you body do you really should do it. Finally for my last tip it will be Find skincare items that are for dry skin to help combat it! So many items say ‘recommended for whatever skin type’ and finding products such a face washes and face scrubs that help dry skin will work a dream because they’ll contain ingredients that will help your skin like rose or something else, so they are literally made to help your skin. Hopefully I will have more tips to share soon because I really can’t see the dryness of my skin clearing up anytime soon with the medication so I guess I’m just going to have to find more ways to cope! Let me know any products or tips anyone has if you have dry skin in the comments it’ll be really helpful!